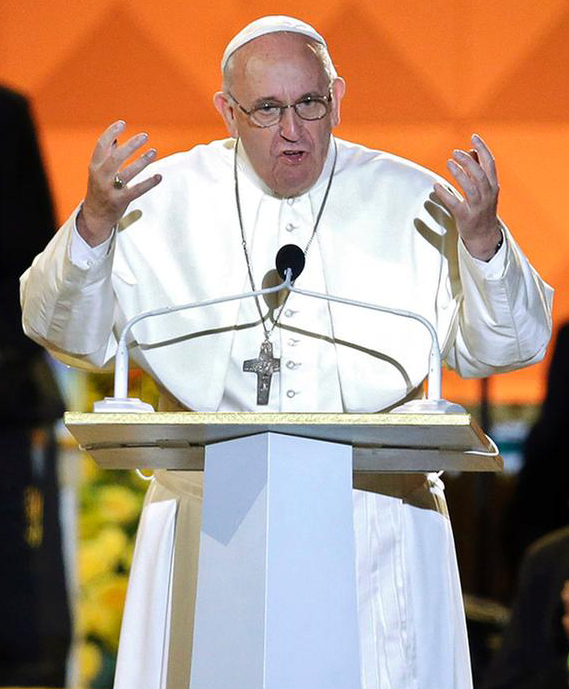 There’s a lot of discussion about Pope Francis’ remarks in a homily he gave last Tuesday. Although his speech, to me, focuses on what is required for peace, namely “encounter,” discussion seems to focus on faith vs. good works, and what is the best path to (I don’t know what word to use here). “Doing good” is a principle that unites all humanity, beyond the diversity of ideologies and religions, and creates the “culture of encounter” that is the foundation of peace: this is what Pope said at Mass this morning at the Domus Santae Martae, in the presence of employees of the Governorate of Vatican City. Cardinal Bechara Boutros Rai, Patriarch of Antioch of the Maronites, concelebrated at the Mass. The part that is lighting a fire under people, especially Catholic leaders, is the Pope’s statement that all are redeemed, “even the atheists.” … “Everyone! ‘Father, the atheists?’ Even the atheists. Everyone!” But the Church’s leaders say that “outside the Church there is no salvation.” No amount of good deeds is “sufficient for salvation.” To these leaders, it is not only atheists, people who profess no belief in God, but also people who don’t call their god “Christ,” who will not be saved. So, we are all redeemed, but we are not all saved? What’s the difference? If we, each doing our own part, if we do good to others, if we meet there, doing good, and we go slowly, gently, little by little, we will make that culture of encounter: we need that so much. This entry was posted in Uncategorized on December 27, 2015 by Bix. A “culture of encounter.” I like that. I also like his, ‘Unfettered capitalism … is the dung of the devil,” and “Mercy before judgment.” I’m no Biblical scholar, I just think he says some neat things. Thank you so much for posting this–I missed it and am thrilled to read it. And yes, in addition to his “inclusive Godliness” written in our hearts, his condemnation of unfettered capitalism is just so wonderful. I LOVE this man! And the Vatican is just freaking out over his ideas!!!! As I said before, I hope he has a food taster (but I’ll bet he doesn’t–he wouldn’t endanger someone else that way).